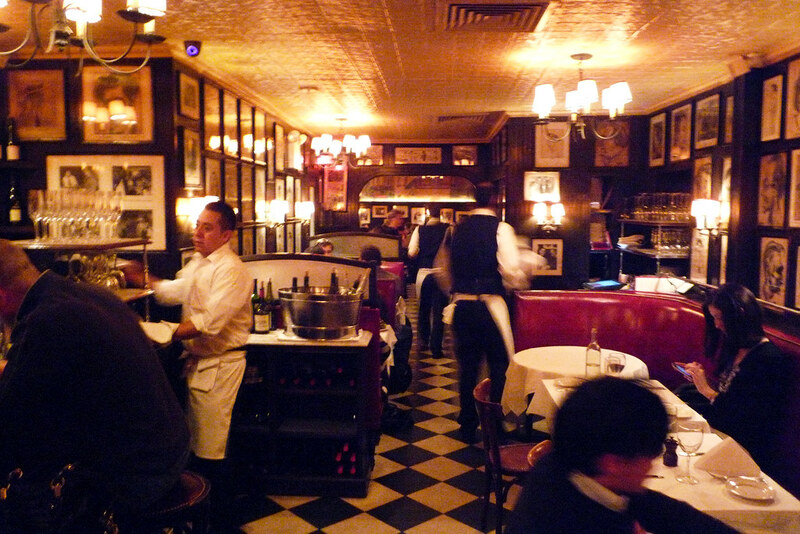 In this solo dining adventure, Gary has the Black Label Burger at Minetta Tavern. In New York City, there are overhyped burgers and their are excellent burgers and at Minetta Tavern, you have both, all in the same burger. Since its introduction over a year ago, their Black Label Burger has proven to be a very popular one while simultaneously drawing a significant number of detractors. Well, I suppose it’s not entirely unfair – after all, we are talking about a $26 burger here. But it’s some of the arguments against it that are truly logic-defining. Case in point – a Shake Shack burger is $3.50 and you can get seven of them for what you’d pay for the Black Label Burger. Is the Black Label worth seven Shack burgers? Of course not. Would I rather be able to dine seven times on a Shake Shack burger than just once on the Black Label? Absolutely not. That’s where people lose me. You can’t simply trade the experience. That’s like asking a Mets fan if they’d take seven games at Citi Field against the Nationals or just one versus the Phillies – no sane fan would take the Nationals games. I’ve actually had the Black Label Burger before this visit but I didn’t try to take any photos that night because JP and I were sitting in the darkest corner in the bar area. It just wasn’t worth the effort. Sure, I still could’ve written about it then but I figured I’d just use the lack of photos as an excuse to make a return trip. When Lucy suggested we do this last month, it didn’t take any convincing to make this happen. That would be the Black Label Burger, of course. I won’t go on and on about the burger and how it’s prepared – you can read about it on A Hamburger Today if you want to know more – but I will say that this is one seriously well-constructed burger. Besides the usual things I like to see in a burger like proper seasoning and being cooked to correct level of doneness, this burger has one serious quality in its favor – the crust. I’ve never had a burger that had as crunchy a crust as the one here. I’m not talking the kind of crunchiness when its been burnt to a crisp but rather one that takes salt and pepper on the surface, then mingling both with the oil and clarified butter until the griddle’s heat forms the perfect crust. And then there’s the bun which is certainly a tall one but is more pillowy than dense and the sweetness is balanced by the patty’s salt content as well as that of the sauteed onions atop the patty. I’d be remiss if I didn’t mention that a burger this fine could have nothing less than a comparable quality of fries to go with it and that’s just the case here. Crunchy and salty, it hits the spot perfectly. Even better, these pomme frites stay crispy for a long time – I was munching them a good 20-25 minutes after they arrived at our table and they were still crunchy. 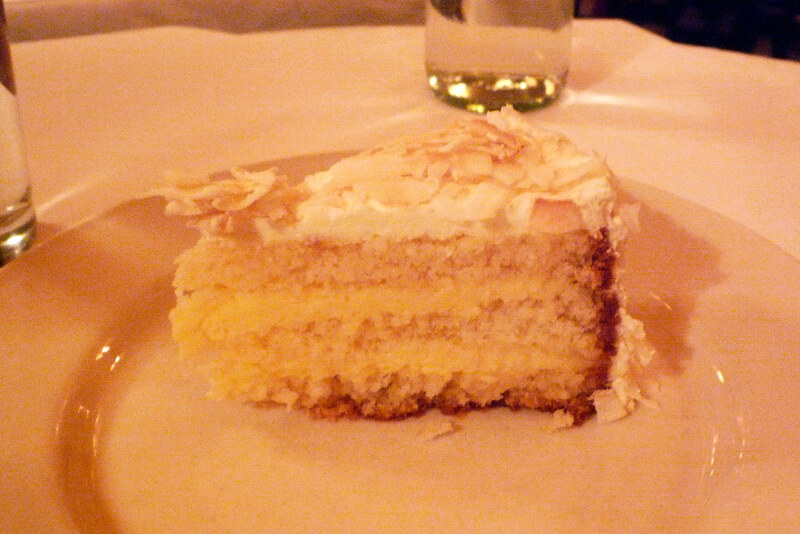 For dessert, we split a slice of the Coconut Layer Cake, with crème fraîche pastry cream and toasted shavings. It’s a solid fluffy white cake and the pastry cream is sweet but not cloyingly so. The coconut shavings are a nice touch but they get to be a little much at the end. 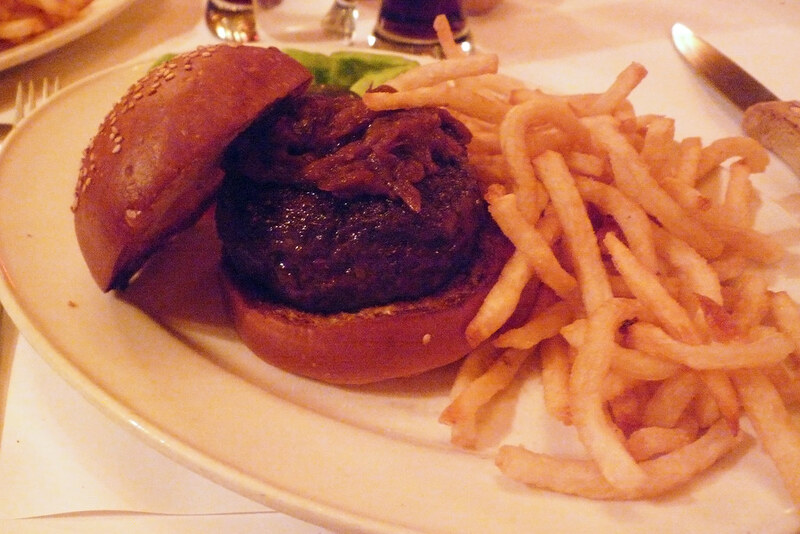 Let’s just jump right into it – the Black Label Burger at Minetta Tavern… is it worth the price? No doubt in my mind at all. If you’d prefer to eat a whole bunch of other burgers instead of paying $26 for this one, that’s your prerogative. But think of the price another way – if you’re gonna be eating a lot of burgers over the course of a year, maybe cut a few of them out and substitute the Black Label because it’s damn well worth that concession. Is this a burger one has on a regular basis? Not unless you’ve got way too much disposable income burning hole through your money clip (if that’s the case, please contact me and I’ll help you with that). But as a burger you’ll maybe have once a year like I apparently have done, it’s nice. Minetta Tavern. 113 MacDougal Street, New York, NY 10012. [Show/Hide Map] (212) 475-3850. 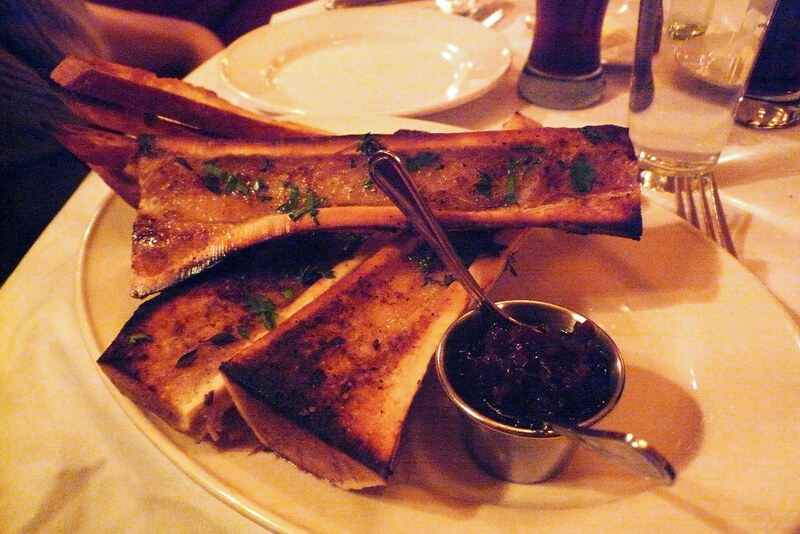 You had me at Marrow. Love it, and the Shallot Confit sounds amazing! I hear they make good cocktails there as well. @Valerie Sadly, there aren’t as many of us marrow-lovers as I would like!